Customs authorities in Kristiansand, on the southern tip of Norway, made a surprise discovery during a routine inspection of a car driving off a ferry from Denmark. They found a boa constrictor in the car that also contained three young men. Local newspaper Agderposten reported that one of the young men, all from Rogaland County, claimed he had bought the snake legally in Denmark. It’s illegal, however, to bring snakes into Norway. “The customs official who checked the car was reluctant to pick up the snake to measure it,” local customs director told Agderposten. Animals illegally brought into Norway are routinely destroyed, but the snake was instead seized from the young men and delivered to animal protection authorities who intended to turn it over to the local zoo. When zoo officials arrived to pick up the boa constrictor, however, they discovered that the snake had been stolen from the storage area at state agency Mattilsynet, where it was being held. 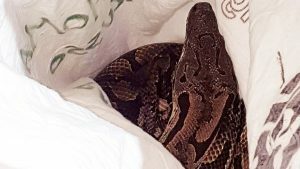 “Only the snake was stolen, so it seems this break-in was not random,” Gunn Kristin Osaland of Mattilsynet told another local newspaper, Fædrelandsvennen over the weekend. Police were investigating, and calling for tips from the public.